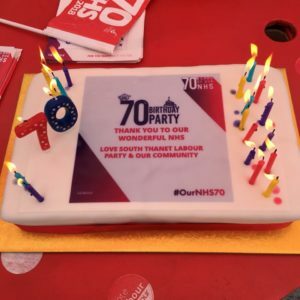 On 7 July, the Labour Party celebrated the 70th birthday of our greatest achievement – the National Health Service. We set up stalls in Broadstairs and Ramsgate. In Broadstairs and along the beach, we asked people to sign a big birthday card to the NHS. In Ramsgate, we handed out pieces of a specially made NHS birthday cake. It was great to see the Isle of Thanet News including details of our celebration in an article about changes to the NHS.